Over the years, Walker Forge in Clintonville, Wis., has stayed at the forefront of die-machining technologies. The company designs and builds its own forging dies to serve the transportation, energy, agriculture and construction industries. It strives to accurately produce these dies in carbon, alloy and stainless steel. The company regularly accommodates quick lead-times—often in under a week—and cannot rely on outsourcing of its work. It needed high-speed milling capabilities that were accurate and reliable. Walker Forge switched from using graphite electrode-based EDM sinkers to high-speed milling. 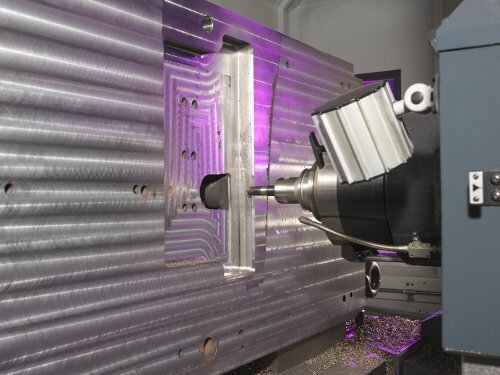 It purchased a Makino GF6 vertical machining center and went through technical training at Makino’s Auburn Hills, Mich., facility to get the most out of its new process. Next, the company added a Makino SP64 wire EDM machine for difficult-to-machine flat parts that required high accuracies. It later purchased a second GF6 machine, a Makino S56 vertical machining center, and a Makino MCC2013 horizontal machining center. After attending the Makino training, the programmers had noticeable confidence in producing their forging dies, which led to better machine accuracy and repeatability. This realization prompted Walker Forge to assign its more complex die designs to the GF6. On the SP64, Walker Forge holds accuracies within 0.0005 inches, eliminating the need for grinding and secondary operations. On its high-speed milling machines, the company now cuts dies 30 percent faster than it did in its previous operations. These milling machines are critical in every aspect of Walker Forge’s operation, especially in hardened dies approaching the 60 Rockwell range. Turnaround times have gone from several weeks to less than a week or, in some cases, a few days. In fact, lead-times have been reduced by as much as 75 percent. The MCC2013 handles large forging press components and keeps maintenance and repair to a minimum. The horizontal capabilities have enabled the company to machine dies it was incapable of handling before. It is producing better parts faster and at a lower cost. In a time where it’s hard to find good, qualified labor, the company has not had to add extra personnel, as one highly skilled operator can run as many as four milling machines at a time.